Kalmar, the business area providing container handling solutions within Cargotec, has received an order for 30 straddle carriers from Transnet Port Terminals (TPT) of South Africa. 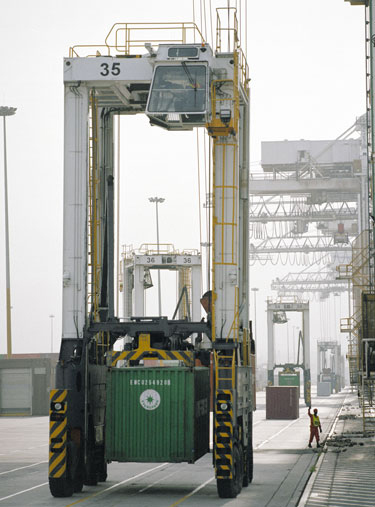 The machines will be delivered to TPT's operations at Durban Container Terminal (DCT) in the Port of Durban starting in July 2008 with the final units arriving January 2009. The Port of Durban, which is Africa's busiest port, handled 2 million TEU in 2007. The unit prices for straddle carriers vary between EUR 700,000-900,000. Kalmar has delivered more than 140 straddle carriers to TPT's container terminal operations in Durban, Cape Town and Port Elizabeth. The units on order will able to stack containers 1-over-3 high, lift 40 tonnes and feature Kalmar's proven 7th generation technology. Cargotec improves the efficiency of cargo flows by offering handling systems and the related services for the loading and unloading of goods. Cargotec's brands, Hiab, Kalmar and MacGREGOR, are global market leaders in their fields and their solutions are used on land and at sea - wherever cargo is on the move. Extensive services close to customers ensure the continuous usability of equipment. Cargotec is the technology leader in its field, its R&D focusing on innovative solutions that take environmental considerations into account. Cargotec's sales are EUR 3 billion and the company employs over 11,000 people. Cargotec's class B shares are quoted on the OMX Nordic Exchange Helsinki.